Majority of births, (98 %) were normal. The normal birth of a living child was the realm of the midwife. A few deliveries were difficult or obstructed. Problem labor were subdivided into obstructed and complicated deliveries. Obstructed labor was subcategorized as head, breech, and arm presentations. The head obstruction was the most common source of difficulty with an incidence of 6 to 12 per 1000. The 3 major complicated labor were: "Flooding" (hemorrhage), "Fits" (eclampsia), and "Puerperal fever". When the midwife has problems with obstructed labor or complicated labor, often times the baby is already dead, she summons a man midwife. During the 17th Century, male midwives only attended childbirth as a complement to the midwife. The man midwife carries with him a set of instruments to hasten the delivery of a child. 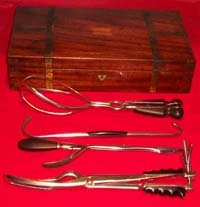 Circa 1840s A complete set of OB instruments in mahogany wood case with velvet lining. The instruments are plated steel with ebony handles. Unmarked. The case is 41 x 22 x 10 cm in dimension. Delivery Forceps Instrument used to seize the head of the baby to hasten the delivery in cases of impacted head. Blunt Hooks Utilized for traction of neck or shoulder of the baby. 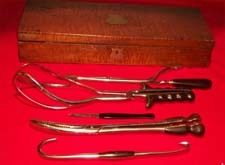 Blot's Arrow Perforator Destructive forceps used to open the head (craniotomy) of the infant and break the skull itself. Powerful destructive craniotomy forceps. The smaller blade is introduced to the perforated skull, the larger blade is placed to the outer surface of the skull. The blades are locked and the fetus is extracted out. Large scissors used to decapitate fetal head, divide collar bones of the fetus on obstructed labor. Dividing the collar bones allowed the shoulders to collapse and thus allow delivery. 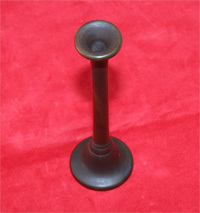 Ebony handle with upturned knob in the end. Unplated steel. Inserted inside the fetus' endotracheal tube for resuscitation. Fig 3794 pg 548 Tiemann. Insturment for holding or changing the postion of the umbilical cord. Used to reduce the umbilical cord in cord prolapse. Fig 3789 pg 584 Tiemann. 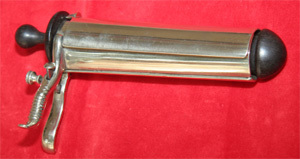 Heavy unplated steel with French lock. Blunt and crochet end of handle. 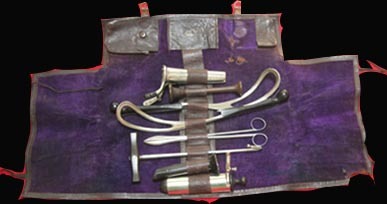 A rare complete set of gynecology instrument dated 1886 by Schmid Stuttgard in its original velvet lined leather bag. It consists of a bakelite monaural stethoscope, an ebony and ivory Braun's decollator, a Simpson's perforator and rubber hadled obstetric foceps. Also three rare vaginal specula: Ricord's bivalve, Ferguson's, and Segala tri-valve. There is an original folded chemist's prescription by Dr Hiller, dated February 1, 1886 with two sachets containing their original powdered camphor (often laced with opium). Ebony- ivory handled destructive obstetric instrument. Decapitation was accomplished by introducing the blunt hook around the fetal head. Unplated steel. Signed: Wickert Munchen. 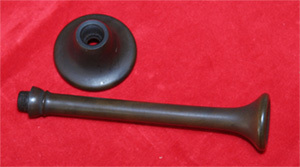 Rubber handle with English lock and upturned knob at the end . Signed: Wickert Munchen. Tri-valve speculum with ebony introducer. by Sharp and Smith, dated 1880. 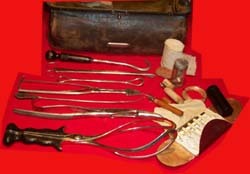 Antique Medical Instr. The Doctor's Bag. pg. 86; Fig 3823, Tiemann. Blunt Hook Destructive instrument used to pull the fetal neck or fetal extremities. Hunter's Depressor Utilized as a retractor for vaginal operations. 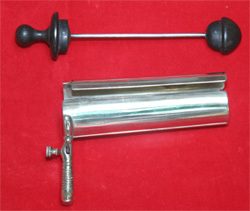 Uterine Sound This instrument is used to meaure the depth of the uterus and to distinguish a pelvic mass from an ovarian tumor. Thomas Craniotomy Forceps After perforating the fetal skull, this instrument is used to pull the skull of the fetus piecemeal or as a whole. Fig 3814, Tiemann. 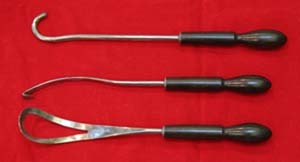 Mathew's OB Forceps Used to deliver the fetal head on difficult labor. It has a German lock, with ebony handle. Fig.3771, Tiemann. 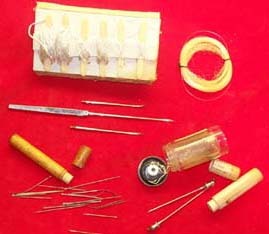 Included in the obstetrical bag are needles of varying sizes in tube containers and spools of silk sutures of different sizes to repair perineal laceration and episiotomy incisions after delivery. 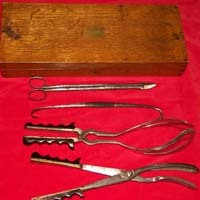 Circa 1820's A very rare English set of destructive obstetrical tools, including a Hamilton forceps invented in 1793. Instruments are unplated steel with ebony handles. 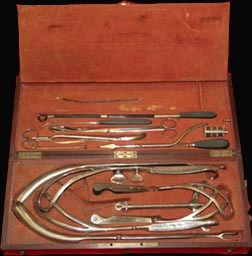 Circa 1870 by Henry Lewis A rare complete set of obstetrical instruments on wood case. Instruments are plated steel with ebony handles. Case is 44 x 16 x 8 cm in dimension. Scalpel Used for Cesarean section or Symphisiotomy incisions. Circa 1875 The case is oval shaped tin with loop handles at both sides and hinged lid with lock. It contains the Smith's forceps. The forceps is unplated steel with finely ribbed removable handles with hooked endings. It is 47 cm in length, marked Mathieu A Paris. This unusual tin case is 38 x 9 cm in dimension. Cased OB Set Four obstetrical instruments on a wooden oak case. Instruments are unplated steel with ebony handles. 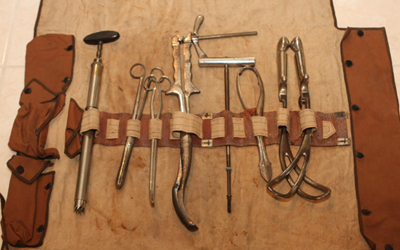 From top to bottom row: Smellie's perforator, hook and crochet, obstetrical forceps, and the Simpson's cranioclast. Signed: Krohne and Sesemann, Manchester Sq. London. Circa 1870's. 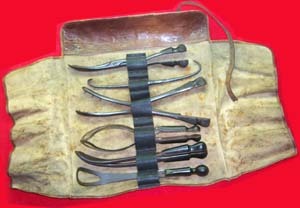 Set of six obstetrical nickel plated instruments on a canvas case. 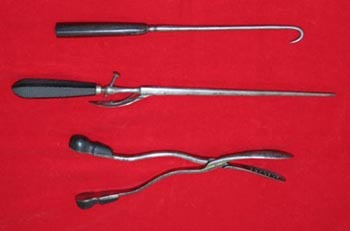 From top to bottom: Simpson's spring loaded perforator, Blunt hook and crochet, Uterine irrigator, Embryotomy forceps with French lock, OB forceps with finger ring, and Simpson cranioclast. Signed: Arnold & Sons, London. 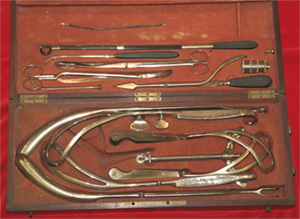 From left to right: Leisnisch Kiewisch trephine instrument, Boer's spiked cranioclast, placenta forceps, Kehrer's cranioclast, blunt hook forceps, perforator, obstetrical forceps. 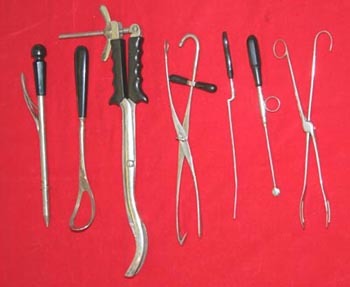 All signed Holzhauer except the placenta forceps which are signed Gruewald. 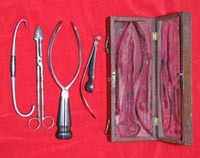 From left to right: Thomas perforator, vectis, cephalotribe, guarded hook and crochet with butterfly handle, folding uterine sound, uterine repositor, and embryotomy forceps. All signed: Tiemann. From top to bottom: OB hook, Basilyst perforator, Conquest craniotomy forceps. Blunt hook, crochet, and a vectis.